SHOWING IN 35MM!!! Celebrating the 80th Anniversary release of this holiday classic. Crotchety miser Ebenezer Scrooge (Reginald Owen) hates Christmas and mistreats his long-suffering employee, devoted family man Bob Cratchit (Gene Lockhart). 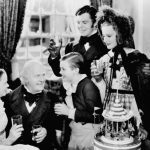 But a visit from the ghost of his former business partner Jacob Marley (Leo G. Carroll) and three Christmas spirits (Lionel Braham, Ann Rutherford, D’Arcy Corrigan) might convince him to change his ways and become more kindhearted. This adaptation of the Charles Dickens classic became a holiday staple for decades. For more event info and ticket pricing, please visit egyptiantheatre.org.